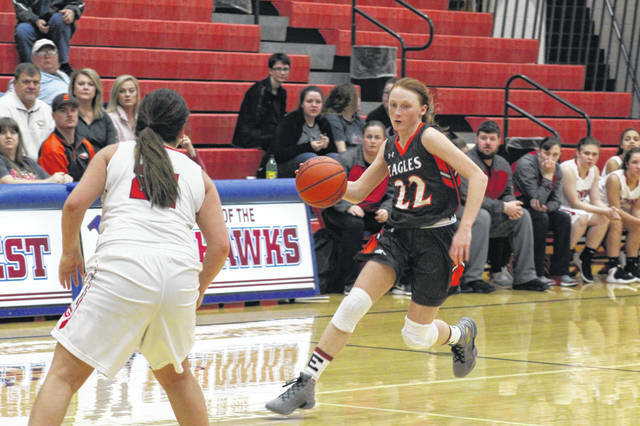 Eastern freshman Abby Cochenour finished with a game high 36 points in the Eagles sectional loss to New Boston Monday night. New Boston freshman Kenzie Whitley with a team high 19 in the Tigers win over Eastern Monday night. 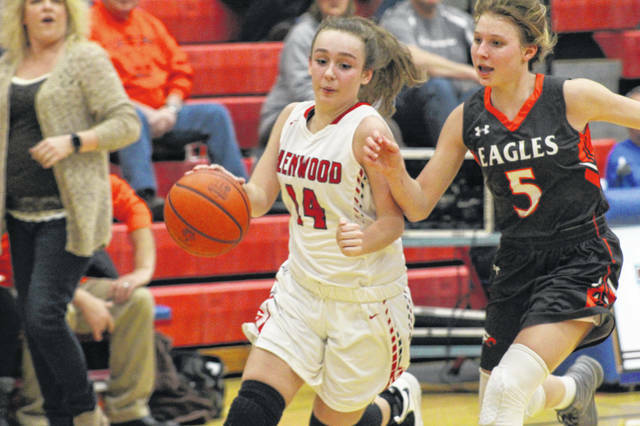 MCDERMOTT – If you would have watched the first quarter of New Boston’s 63-60 win over Eastern Monday night and left, you would have just assumed that New Boston was going to roll to a big victory, giving them a berth in the sectional final. Leading after the first quarter 17-6, the Tigers had all the momentum, closing the quarter on a 17-2 run. But, despite Eastern’s best punch to come back from being down double digits at two different points in Monday night’s contest, it was New Boston who came away with a three point sectional semifinal win. The three point shooting contest Wiley is referring to happened because of two players: Eastern junior Mackenzie Greene and freshman Abby Cochenour. After the first quarter in which the Eagles only put up six points, Greene and Cochenour caught fire, literally. The dynamic shooting duo combined for 12 three’s, six of which came in the final frame. Even though New Boston’s attempts to limit Cochenour and Greene were halted by excellent shooting from the pair, it was the balanced scoring attack of the Tigers that helped propel them to victory. Freshman Kenzie Whitley scored a team high 19 points, junior Lexus Oiler finished with 18, and junior Taylen Hickman finished with a career high 14 points in the Tigers win. With Whitley, a freshman, leading New Boston in scoring with 19, Wiley loves the growth and development she has seen from her youngster over the course of the season, culminating in a great game on Monday. Wiley remarked a few weeks ago in a text conversation that she would love to get a tournament win for this team, to boost their confidence and continue playing in tournament style environments. After Monday night’s win, Wiley got her wish for her and her team’s season to continue for another game this Thursday against the one loss top-seeded Notre Dame Titans. The Tigers and Titans will do battle at Northwest High School Thursday, tipoff is slated for 6:15 p.m.